In User Query, click Favorites. Alternatively, in the Main Menu, click Reports, Queries, then click Favorites on the Query window. Query Favorites is a place to store frequently used queries, run queries, and control user access to queries. From here you can run, add, edit, and delete query favorites. Security permissions control how much access a user has to queries. 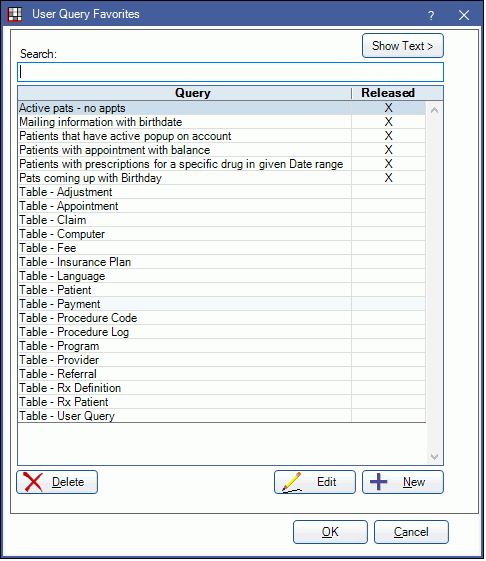 User Query: User can only view and run released queries from the Query Favorites list. User Query Admin: User can run all queries, as well as add, edit, or delete query favorites. Users with only the User Query permission: In the Main Menu, click Reports, Released Queries. Other users: In the Main Menu, click Reports, Queries, then click Favorites on the Query window. All queries the logged-on user has permission to run will display. If a user has the User Query Admin permission, a column that indicates released status also shows. Click Show Text to open a separate panel that shows the text of the selected query. Click Hide Text to close the panel. Type a keyword in the search to narrow results. Double click the query to run. If there are variables in the query that need defined, the Query Variables window will open. For each variable, double click in the Variable column, enter a value, then click OK. Or simply click in the cell to enter. Hint: Many queries include comments about each variable. Click Show Text to open a separate panel that displays the full query text with the associated comment highlighted. Click OK to run the query. The results will display in the Query window. The text in a query can be changed, and its status can be switched between released/not released. The User Query Admin permission is required. On the Query Favorites window, highlight the query, then click Edit. Title: Enter the title of the query. Released: Determines who can run and edit this query. Status is indicated in the Query Favorites window, Released column. Checked: This query can be run by users with the User Query permission. Unchecked: This query can only be run and edited by users with the User Query Admin permission. Checked: Prompt the user to define user variables (e.g. date range, providers, etc.). Unchecked: Do not prompt the user to define user variables. Change variables in the Query Window instead. Query Text: Copy/paste or change the query text as needed. Export File Name: Optional. Enter the default file name to use when this query data is exported. The User Query Admin permission is required. On the Query Favorites window, click +New. Or on the Query window, click Add to Favorites. Enter the Title, Query Text, Export File Name, and mark the query as released or not released. Highlight the query text, then right click and select Copy. In the Query window, click Favorites, then New. Right click in the Query Text box and select Paste. The Query will now list as a Query Favorite. We recommend testing it (double-click to run). On the Query Favorites window, highlight the query to delete. A confirmation message will display. Click OK to delete.